Three times DC Direct has released a Commissioner Gordon action figure, and three times has it been in an artist-specific line. The first Jim Gordon ever (if you don't count that weird Batman: The Animated Series version, which clearly we're not, because otherwise we would have called it the first Jim Gordon ever) was the Jim Lee version, from Series 3 of the Hush line; after that came a Tim Sale interpretation, from Dark Victory; and now this one in the Greg Capullo Designer Series, which is based on a specific artist's work so hard that the line is actually named after him! But despite the fact that this figure is called "Commissioner Gordon" on the box, it is emphatically not Commissioner Gordon. This figure is based on "Secret City," the first chapter of Scott Snyder and Greg Capullo's "Zero Year" story. Basically a chance to update Frank Miller's "Year One" for a new generation, with new sensibilities, "Zero Year" is an amazing comic, but since it's set in the past ("six years ago"), Jim Gordon is a lieutenant, not commissioner. The packaging is lying to us! James Gordon is a bit younger in the "New 52" than he was in the "Old More-Than-52," but since this figure represents the past, he's even younger than that. There are a few wrinkles on his forehead, but his hair is orange, rather than gray. His glasses are still a separate piece, but they're glued on and thus less likely to break than on the Hush toy. The figure was sculpted by Jonathan Matthews, and is looking quite nice. Well, the pants are reused - they were first seen on the Riddler, but are also shared with Two-Face - but the rest is new. Credit to Matthews though: all the figures that use these legs still get unique shoes, which is more than Mattel ever did. Jim is wearing his short trench coat, as he should be. The coat was kind of an important plot point in "Zero Year," so to not have it would betray a vast oversight on the part of everyone involved in the making of the toy. Despite the fact that "six years ago" would have meant 2007/2008 when the book was published, the colors really say "1970s" - it's one thing to conceptually accept that Batman's past is always sliding forward, but our minds need a little push to actually codify that past as past, you understand? If we say to you that one of the hardships faced by the citizens of Gotham was that the massive blackouts of "Zero Year" prevented them from going to the theater and watching Michael Bay's first Transformers movie, does your mind automatically equate that with some long-ago event? Someday it will, sure, but not yet. So Gordon is wearing an avocado green shirt and a wide harvest gold tie, because comics' main audience will recognize those as "colors of the past." The articulation is decent. Gordon's got a balljointed head, swivel shoulders and biceps, hinged elbows, swivel wrists, a waist, T-crotch, hinged knees, and balljointed ankles. The shoulders would be better as a balljoint or even swivel/hinge combo, but this is sufficient. 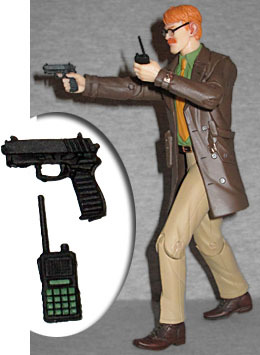 His hands are open just far enough to hold his two accessories: a small, squarish pistol, and a police radio. Of course, if he had double-hinged elbows, he'd be able to get his radio up to his mouh properly, but that was not to be. 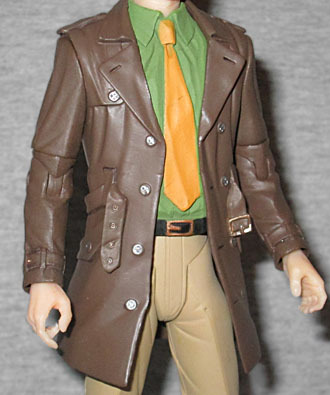 This figure isn't a huge improvement over DCD's first Commissioner Gordon, but it is an improvement. And it has the distinct advantage of having just come out, so you can pick him up at your local comicshop very easily. He may not be the gray-haired old man he used to be, but that's nothing to be afraid of, and you could repaint him yourself if it bothers you that much.